Umbilical cord charm with your baby's cord or placenta encased in resin, with colour and birthstone options. You can add a laser engraved washer here. Our babies are only small for a moment. They gain their independence so quickly starting from when the umbilical cord is cut separating them from your shared placenta. We will cast a tiny bit of your baby’s cord stump or dried placenta powder into an umbilical cord or placenta charm bead encased in crystal clear UV resin. There’s a really informative DIY placenta encapsulation video here on YouTube but please be warned, it’s very graphic! *tw baby loss* If you are looking for a loss piece for a baby or child then please email Nikki on info@treeofopals.com with the subject line “Pro Bono”, who will try to reply straight away. We have a small fund available for these pieces and some instructions on our Non-Profit Baby Memorial page on how to save a first curl, placenta and umbilical cord if your baby is to be born sleeping and ash if they are cremated. All of our European charm beads come with solid silver Tree of Opals branded cores that fit nicely on Pandora and Trollbead bracelets as part of your collection. Our charm insert hole size is around 4.5mm. For an interesting history on European charm beads have a look at this Wikipedia page. I absolutely love this piece. I had kept hold of my little boy’s umbilical cord stump but it was just loose in a drawer. Now it is a beautiful piece of jewellery, and will be preserved forever. Umbi cord is surprisingly gorgeous set into resin. I love it! 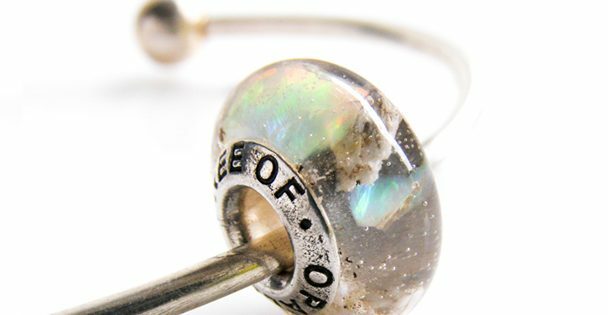 I love my umbilical cord stump charm very much and the genuine opal adds a beautiful shimmer to it. The charm was made from the stumps of my two babies and will be treasured forever. Thank you so much! My charm arrived this morning and I can’t believe how beautiful it is. Such a special piece that symbolises the bond between me and my baby and something that I can treasure forever. I absolutely love it and was definitely worth the wait, already looking to order another piece.